two speed motor) we’ve noticed a very slight, instantaneous hesitation accompanied by a very noticeable “slap” sound that might be best described as iron striking iron. 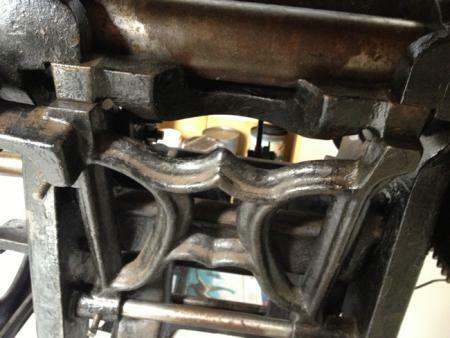 We’ve located the noise in the right hand gear - the one that has the journals on the inside which a bearing follows - which also has the right side drive rod attached to the back, or toggle side of the press. This noise occures when the drive rod linkage is at 6:00 position. It does not do it every cycle, but about 7 times out of 10 cycles. There is always an ever so millisecond of a halt in the press which accompanies this noise. Everything is oiled properly with no binding that we can tell. Apart from this sound and slight hesitation, she runs very smoothly. Any ideas what may be happening here? Ok, I corrected the title. Just figured out there are editing features. Colour me Einstein. Any cracks in the track inside the gear? The platen rocker cam roller arm on my 10x15 OS is adjustable by loosing a bolt in the arm casting where the platen rocker shaft goes through it. If yours has the same feature perhaps it needs some adjustment. One impression every two seconds is 30 per minute which isn’t lightning speed but still pretty fast. Perhaps the old beast isn’t up to it. I’ve noticed that when a press is run fast all sorts of little oddities can show up that don’t appear when it is run at a slower speed. Ok, Rich: And btw, thanks for the response! You may have to explain just what the rocker cam roller arm is exactly, and where that adjustment can be found. You are correct about the speed thing. Right now at slow speed, it’s running slower than average treadle speed. The sound does vary with speed. But the sound and momentary “halting” that corresponds to it still occurs. The terminology regarding the parts on this press are terms I am not really familiar with beyond the typical things we deal with every day on these: Platen, type bed, flywheel, ink disc, saddles, bales, bearings, gripper bars, etc. But I don’t even know the proper name for that big gear to the right of the delivery board that has the bearing journals inside which serves as a slideway for that bearing (which we just unpluged the oil port thereof) to travel through. There are no detailed diagrams beyond the ultra basic that I have been able to find. What does the rocker cam do? Is that what pivots the platen and controlls the dwell? The roller that moves around the track in the big (bull) gear is attached to a cast iron arm as you can see. On my press that arm is a seperate part and attaches to the press on the large shaft the platen is on. In other words, that arm can rotate on that shaft a certain amount thereby positioning the roller in a different position. There is a bolt in the arm where the large shaft goes through that is tightened to the shaft. This both keeps the arm in position and allows the travel of the roller through the track in the bull gear to open and close the platen. The track in the bull gear is shaped to both open and close the platen and have places where it “dwells” in the open and closed position through the way it interacts with the roller and arm attached to the platen shaft. I don’t know if this is causing the problem but it’s something to check. 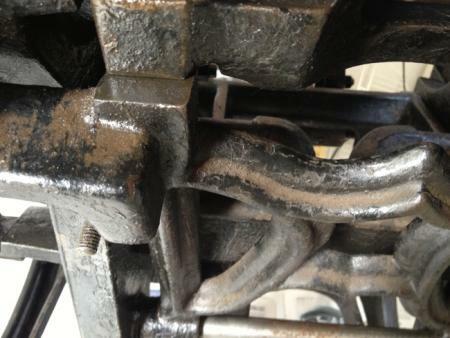 Also check for play in the arm bearings between the bed and the bull gear. Also check the small gear to make sure it is not loose. I don’t mean loose as in it slides along the shaft, but sometimes the key holding this gear in place is not a snug fit on its sides and the small gear can rotate very slightly on the shaft and make a clunking noise, especially on impression where there is resistance. You may need to put in a brass or copper space or two as shims to tighten it up if this is the case. Great, Rich!. We’ll go over this later this week down at the shop and see if we can get to that adjustment. I haven’t encountered this on a press, but I have on farm equipment. It usually indicates a gear that has something wedged in it or is cracked. The pause is typically from the gears either not meshing in correct time and tooth hitting tooth (it can be caused by one cog expanding from a crack in it) or by something being wedged down between the teeth that the gear has to climb over, thus the pause, followed by the thump. Before adjusting anything, go over each gear very carefully with a flat blade screwdriver and a flashlight, checking each groove to ensure it is very clear. Run the flat blade screwdriver through the bottom of each groove in each gear to check for obstructions. It may be small and covered by old grease, so you should check to see that each channel is clear. If this doesn’t turn up anything, then check for cracks. Rotate the press by hand very slowly while watching each gear. you should have a good idea of where in the press cycle the pause occurs. Look for hitting of teeth or non-meshing on each gear. If you rotate the press backwards through the cycle and it doesn’t occur, it probably isn’t something between the teeth, but a cracked gear instead causing teeth to hit teeth. Depending on how much you’ve run the press already you may see the beginnings of wear in the places where teeth are hitting teeth. If neither of these yield anything, then go to the cog adjustment mentioned above. Doing an adjustment early may correct the symptom but not fix the cause, resulting in wear problems down the road. My first platen, a Challenge-Gordon, had the same symptoms, and the pause-and-slap was simply was the rocker rotating slightly less than it should and then the rocker lock jumping the rocker into correct position. However, unlike Rich’s C&P, the rocker arm was not adjustable by just loosening the setscrew, because the rocker arm was keyed to the platen. But a previous owner HAD repositioned the rocker arm, drilled into the assembly, and inserted a pin (parallel to the keyway). I returned the rocker to the original keyed position, which resulted in the rocker coming into position with a slam before the rocker lock even moved. But I wasn’t about to find the intermediate position and re-key to that. The more I think about it, the more the idea of obstruction in the mesh of the small flywheel shaft gear and the Bull gear makes sense. The hesitation and sound happens when the gear is at one particular place: platen open, connecting rod linkage of the large gear at 6:00. I’ve just posted for Nick at Mama’s Sauce to take a look at the mesh and check for obstruction or signs of a fissure or crack. Hopefully it’s an obstruction that can be cleared, solving the whole problem. Thanks again for all the input, guys. I’ll be coming here more often. Hi everyone! I am having a similar problem and although I have cleaned up everything and oil every single hole, the clunking noise still is there when I print with packing. When there is no packing noise disappears… it’s as if the machine is finding too much resistance when printing. Can you please watch this video I’ve uploaded to help me solve the mystery? i’m not sure about a press as old as yours. but it is turning backwards compared to all others i have seen. 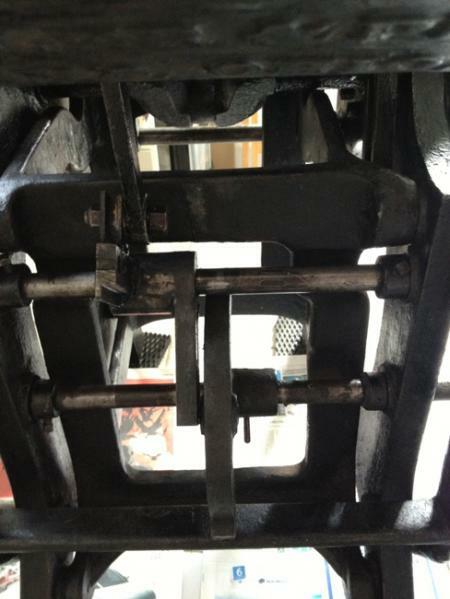 Also check to see that there is clearance between the roller rails and the fully packed platen. 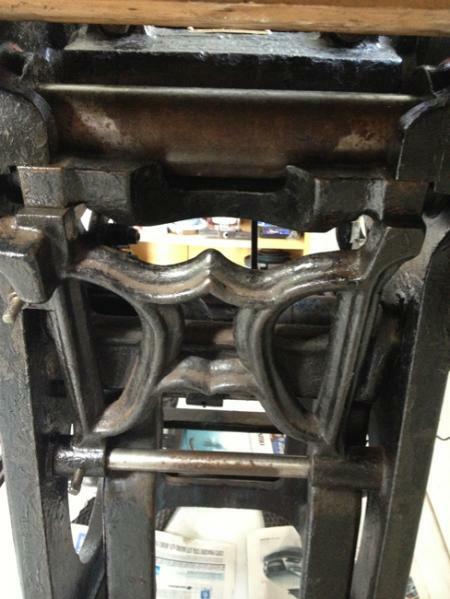 I unwittingly had moved my grippers all the way to the ends of the platen (thus emulating this condition) and was wondering why my press starting acting really funky. The combination of the packing and the roller rails cannot exceed .918 by much. The die-cutting trade used to mount bed bearers in their machines, for the sole function of ensuring that the platen would load evenly across the form because it was “bottoming out” on the platen. Since your press is making this noise at impression, that is the first place I’d look. Since the video shows this problem with the impression lever on, you might want to knock off the impression and see if it is still there. If so, I’d look at the gears, it only takes a little piece of leading jammed into them to create interesting problems. Mike is correct. Your press is running in the wrong directions. The flywheel, if you are standing facing it, should rotate counter clockwise. The dwell time is longer when it rotates in the correct direction. I doubt this will change the noise much but some. Your movie is helpful. If focus on the throw off saddle connection to the back shaft, the throw off linkage and on the outer arm for throw-off shaft at the side, I think you might find one of your problems. I noticed an extra hitch up at the saddle at the end of the impression. I think the pin may have fallen out of the outer arm for throw-off shaft. It goes through both sides of the shaft and the connector arm. If it is missing, the force of impression makes it go further or shorter because the lock nut can’t hold it tight. Check that. Additionally, the impression will get louder with increased pressure, especially of you are doing deep impressions. There isn’t a real clear shot of the rocker lock (frame with “X” shaped brace just under the feedboard) in your video, but if it is not firmly locking in place, you may have some unusual behavior in the press. Check to see that it fully engages prior to impression. You could simply turn the motor around so the shaft is facing the opposite direction and mount it that way (if that can be done) to reverse the rotation relative to the press. Yes! That was exactly what I was thinking, to turn around the motor, I will definitely do that, thanks Bob! @ longdaypress, a cam follower going in any direction over the low spot on the cam, the dwell will be the same.